WindEagle and RainbowHawk, twin Keepers of the Origin Teachings of the Delicate Lodge, carry an ancient body of self-knowledge and earth wisdom teachings that derive from ancient indigenous American cultures. As Métis teachers, they have journeyed together since 1987. 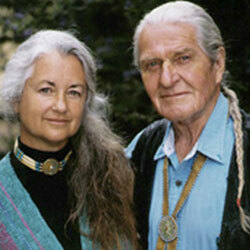 In 1995 they founded Ehama Institute, a not-for-profit teaching institute in New Mexico. They have worked with individuals, groups, organizations, and communities throughout the world for over two decades. In 2003, WindEagle and RainbowHawk published their first book, Heart Seeds, a message from the ancestors, in which they retell the ancient stories of remembrance and share the relevance of these “heart seeds” for both the present time and our collective future. In 2007, the World Foundation for the Discipline of Peace, a Global Expression of Ehama Institute, was formed to create a world-wise People’s Movement of the First Peace to bring together many traditions, cultures, and ages to celebrate their unique ways of creating peace in the self. To read more about Windeagle and Rainbowhawk, visit their personal site.